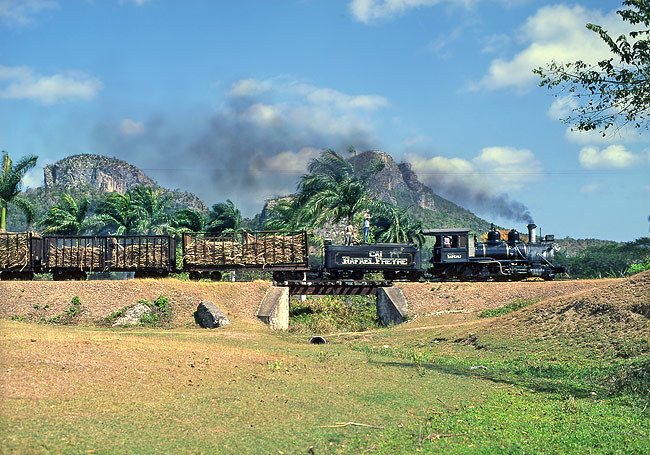 In the last gleams of a hot caribean day, Baldwin 2-8-0 No.1390 heads towards Rafael Freyre with a long string of loaded sugar cane gondolas. Central Agro-Industrial CAI "IFrain Alfonso" near Stanta Clara had the biggest engines of the country. 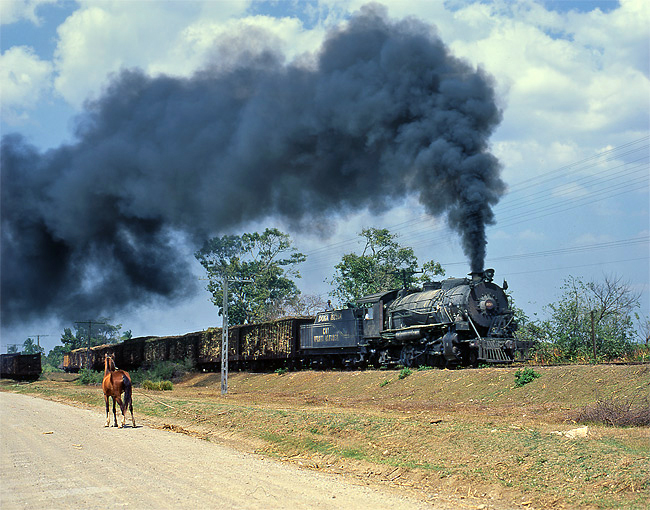 When Baldwin #1850 accelerated its loaded train near Pozo, even the horse in the foreground got scared..
Jose Smith Comas near Cárdenas was famous for its immaculate engines. While the whole country seemed to lack of paint and colour, the engineers at José Smith Comas always managed to get some supply to keep its engines in perfect state. 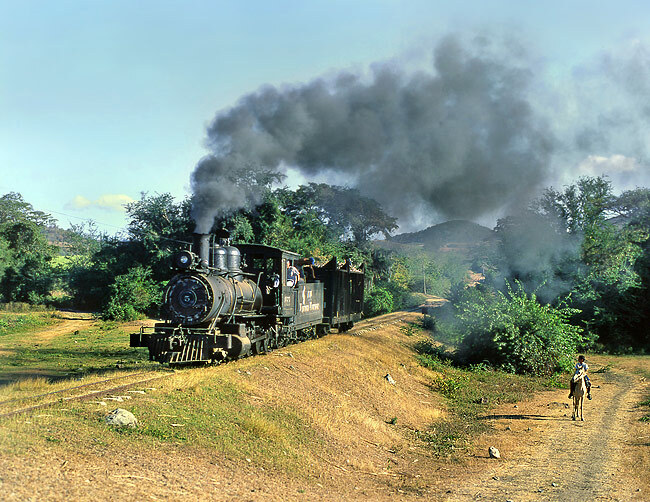 Baldwin 2-6-0 No.1531 from 1925 headed with an empty outbound to the fields, near Progresso. 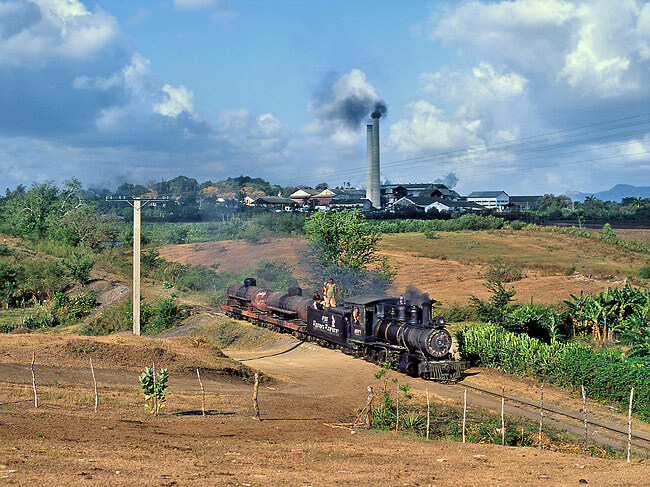 CAI Mañalich had, as a peculiarity, both standard and narrow gauge lines with steam engines for both systems. The picture shows a n.g. 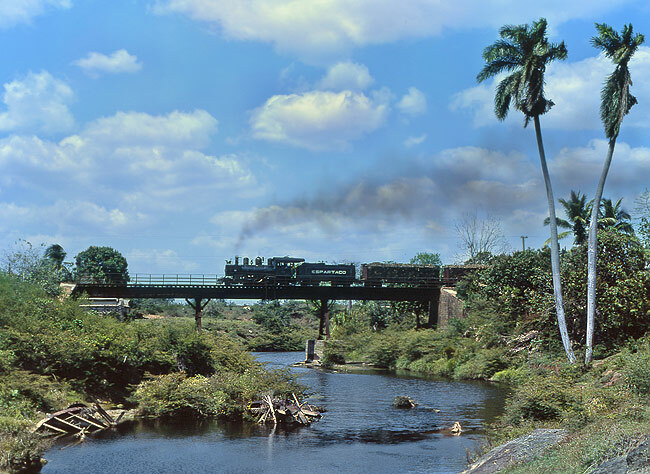 train approaching the mill, crossing the La Habana - Santiago de Cuba main line. The lady in front of the engine was in charge of operating the signal that was the only security measure for the level crossing with the main line! Getting to the spots was often difficult, not only because of the poor road conditions, but since roadsingns were virtually nonexistent and detailed maps something like wishful thinking in a country that barely could print newspapers due to lack of paper, ink and money. While the country was short of pretty much anything except sugar and rum, labour was available in abundance. So it was never an issue getting some help, for instance for fixing flat tires or giving direction. Here, a friendly loco fireman from Espartaco guided us to all the way to that bridge, a location we probably would never have found without his kind assistance. One of the highlights of any Gricer's trip to Cuba was certainly a visit of the Rafael Freyre system in the remote Holguin Proince with its wonderful collection of 2'6" Baldwins. Here, No. 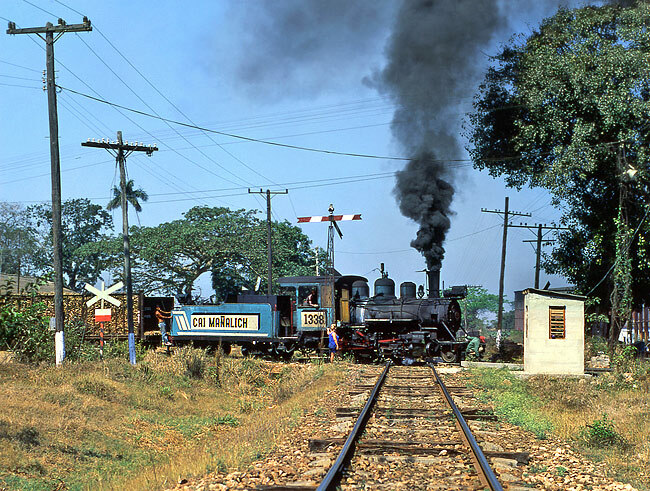 1387 runs uphill from one of its many branches where loaded cars had to be picked up, which then were added to a lengthy main train that had been left meanwhile at a junction. 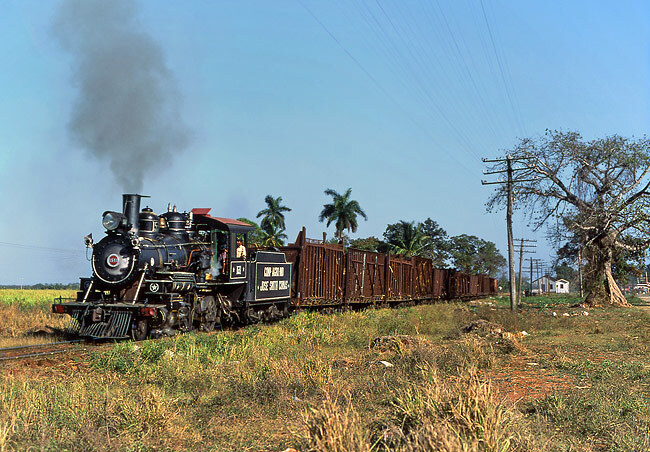 Baldwin No 1386 was in perfect condition in 1999, when it passed the scenic limestone hills with a loaded train. Safety at work was not a top priority in Cuba, as you can tell from the staff travelling on top of the tender. A fair portion of good luck was needed for this picture of a freight on the Peurto Vita branch at Rafael Freyre. Only once or twice a month such a train was sent to the port to get fuel for the engines and the mill. 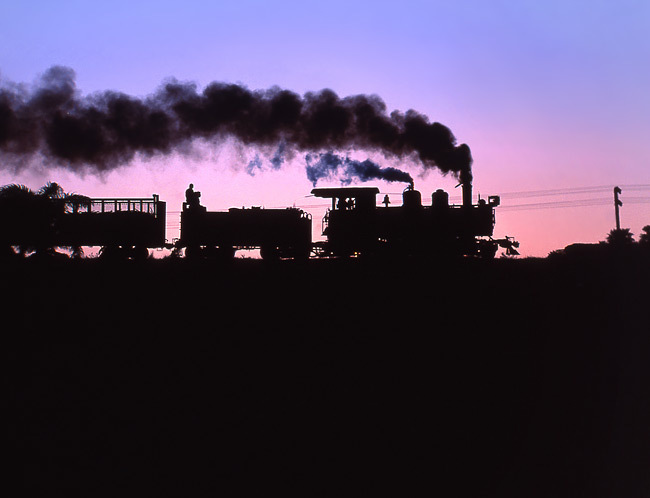 When Baldwin 1387 finally had collected all the loaded wagons by late afternoon, sun was already setting behind the hills, allowing eventually this silhouette on the final leg to the mill near Barjay. All Pictures taken in March/ April 1999. 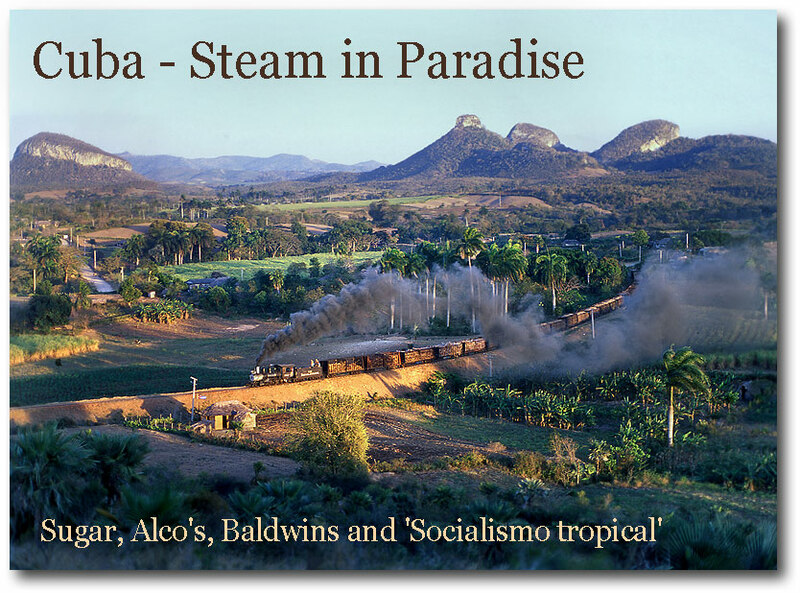 Links: Cuba section of Steam Railway Photographs by David Longman, a great website on regular steam in Germany, Poland, China, Cuba and Zimbabwe..